Is there anything better than an apple pie? 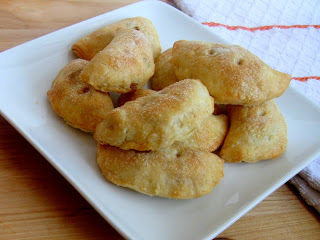 Tiny apple pies maybe, that fit in your hand? Yes please. That helps with not eating half a pie but not so much with not eating half the batch. Crisp and slightly sweet on the outside with a warm cinnamon inside these are a treat to be had. Unfortunately for my husband I whisked all but a few of them away to take with me to meet some friends. He was sad, but they were happy. I will just have to make him some more! 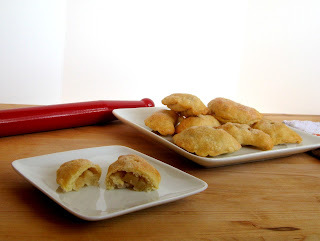 I used Ginger Gold apples when I made these, mostly because they were on sale and fit what I needed. I'm a pretty big fan now and may just continue to use those. You definitely want to go with a tart apple though, just like for most apple pies you would make. When you're reading through the directions you may see something a little different. I baked these on a cooling rack. What? Yes I did. I wanted to let the air circulate all around them so that I wouldn't need to worry about a soggy bottom like some pies get. At least some of my pies. Anyway...pies aren't really my thing, much to my husband’s sadness as he loves pies. I should have capitalized the "l" he's such a big fan. They never have been, probably never will be. That's why I'm not sure you could even find an actual "pie" on my blog. Maybe one but I would actually have to go look through my recipe index and it's not that important. You can find all sorts of other fun desserts and breads though so he can only complain so much :). These are relatively quick to put together just like a big pie, roll, cut, trim...if you have helpers it makes it go even faster, or slower, depending on how much your helper is actually "helping". My helper through it was much more fun to fling flour around the kitchen. Awesome. I know. So...the process went a bit slower. 1. Make pie crust: In a food processor blend together the flour and salt. Add butter and process using pulse until crumbs are about the size of peas, about 10-15 pulses. Mix together the egg, vinegar, and water in a bowl. Add the liquid mixture through the feed while pulsing the processor. Do not run the processor “on” while adding liquid because you need to be very careful to not overmix the dough then it will be tough, that’s why I only use “pulse” when making this dough. 2. Once the mixture is almost together with just a few dry crumbs in the bowl then turn it out onto a cutting board and gently work it into a ball with a few turns of the dough. Wrap in plastic and refrigerate for at least 30 minutes. 3. Preheat oven to 350F. Dice apples into about ¼” pieces and place in a bowl. Add the sugar, flour, salt, and lemon juice. Stir until combined and the apples are completely coated. Set aside. Place a cooling rack onto a cookie sheet that has been lined with foil (if you want less mess) and spray the cooling rack with non-stick cooking spray. 4. When the dough is ready, roll it out to about ¼” thick and cut into 3 ¼” circles. Fill the circles in the middle with about 1 ½ teaspoons of apple filling. 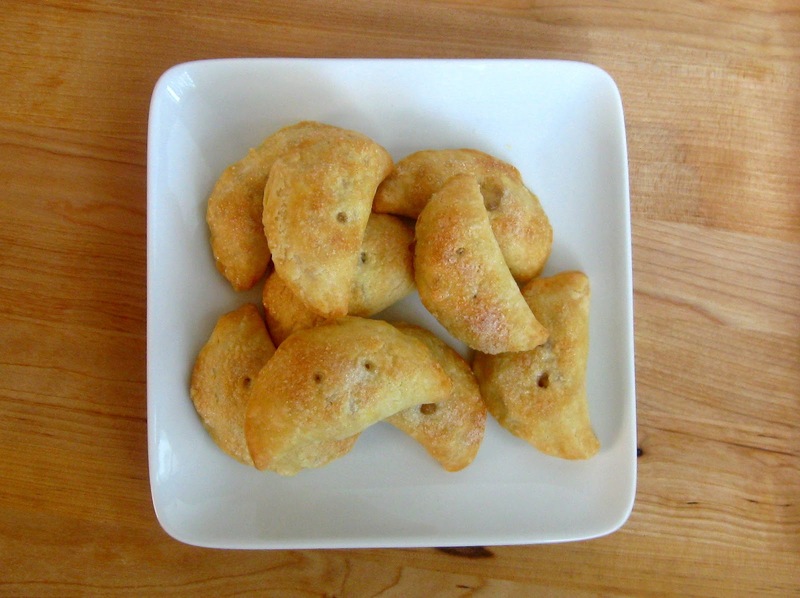 Fold over the dough to create a half moon shape and using your fingers seal the edges. 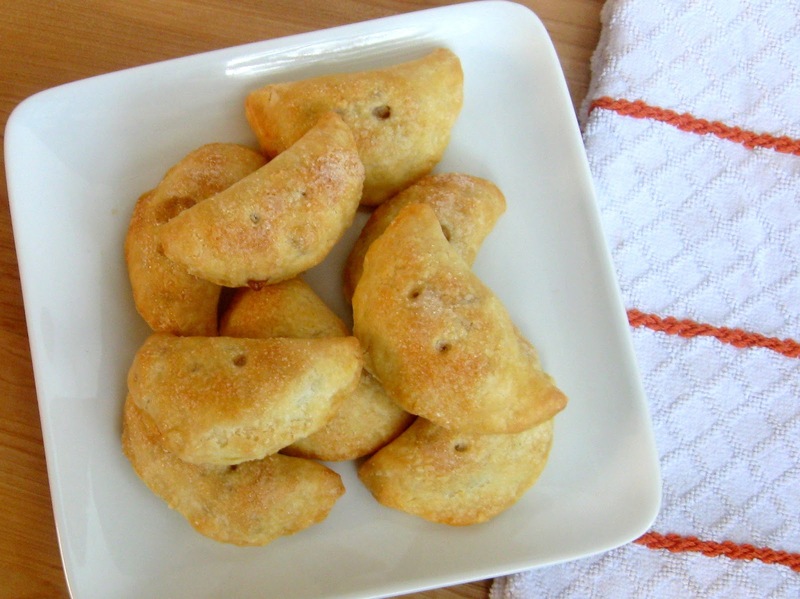 Place the hand pie on the prepared cooling rack on the pan. Repeat with the other hand pies. 5. Poke two little vent holes in the top of the pies with a toothpick. Brush each one with milk then sprinkle with sugar. Bake for 32-34 minutes or until golden brown on the tops. Remove from oven and gently loosen from the cooling rack, if necessary, using a cookie spatula. Cool. I love cute little pies that I can hold in my hand...just means I can eat more:-) My little ones always want to help too, and it always takes more time. But I enjoy spending the time with them...even if there are lots of messes!!! I also love individual desserts, it helps control portion size (when you want it too) otherwise I know I could eat three :). It's always a lot of fun when G helps me in the kitchen, he loves it too!